It’s a great play call because it worked. If it had backfired, running off the remaining five seconds and being stopped shy of the goal line, the Steelers get blasted this morning for a terrible play call. Those value judgments are subjective, and dependent upon the outcome. All that can be said objectively about the call to direct snap to Le’Veon Bell in the shotgun is that it was audacious in a way you too rarely see in the NFL. “It was time to go to the mattresses,” Mike Tomlin said. The three biggest plays in the Steelers’ unlikely 24-20 comeback win in San Diego were, respectively, one thought up by the injured QB on the sideline, a broken play, and one—Bell’s gamewinning run—that was only installed in practice this week, and failed there. After the Chargers answered with three to retake the lead, the Steelers got screwed. Eighteen seconds ran off the clock after Pittsburgh’s touchback. No one on the field noticed. The NFL is incredibly lucky that the Steelers didn’t run out of time—imagine the firestorm today. The Steelers stalled a bit once they entered Charger territory, eventually facing a third and 6. With a three receiver set that saw the tight end blocking and Bell belatedly going out for a pass, no one could get open. But with the secondary completely locked up, Vick sprinted up the middle for 24 yards, his first and only run of the game. After a pass to Heath Miller at the 1 (and an unnecessary roughness foul that spared them from having to use their final timeout, which would have made their choice for them), the Steelers had to decide whether to kick the field goal and go to overtime, or try to win it then and there. “I knew we were going for it,” Bell said. “I knew the play was going to get called. We were talking about it all week. The play—a wildcat formation, with a direct snap to Bell at the six-yard-line—was a gamble. Pittsburgh could have split the difference. Given their remaining timeout, something like a QB sneak or a quick pass would have left time for a field goal if it didn’t succeed. But what they went with wasn’t guaranteed to leave any time on the clock, as it ultimately didn’t. A couple of other things going against it: the play is relatively new to the Steelers’ playbook, only being installed a few days ago. And it had yet to work. It was not a “safe” play, but that was one of its advantages. If observers couldn’t quite believe Bell would go outside, taking up more time and foregoing the possibility of a consolation field goal, the Chargers didn’t believe it either. “I saw the D-line kind of slant to the inside,” Bell said. Bell hit traffic, wriggled outside, got his leg wrapped up by Donald Butler, extended his arms, and crossed the plane by inches before his knee touched down. 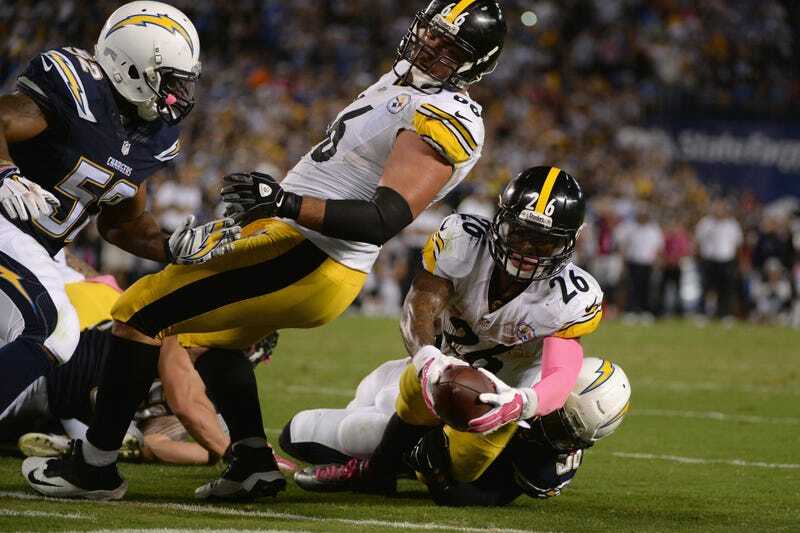 A review confirmed the touchdown and the hard-earned win for Pittsburgh. It’s a pleasure to see a team willing to gamble, and get rewarded for it.